Hi guys, I'm hoping someone here can help me out. I have an older PC, a Shuttle SP35P2 Pro (Prima Series) that I'd like to upgrade with one of your SSD drives. I bought a Crucial BX500 120 GB SSD. Now, I want it to run as optimal as possible so I'm trying to get it to work with AHCI. And here the problems begin. 1. The drive is connected to the motherboad along with a SATA DVDRW. 3. Only the DVDRW is recognized by BIOS. Picture here: http://shrani.si/f/i/XP/2mQzVTNQ/20190116185401.jpg The SSD should be listed under Serial ATA Channel 1. But for some reason there's nothing there. If I chose that Channel I do however get all the info about the SSD. Seen here: http://shrani.si/f/44/oQ/j4WGPGk/20190116193333.jpg . How is this possible? The drive is not listed, but BIOS seems to know a lot about it. The drive also shows up during POST without issue. Pictured on Channel 1: http://shrani.si/f/2B/UB/2e98hZHR/20190116185352.jpg The only mention of the SDD within BIOS that I could find is on the hard drive selection menu, listing the order in which the hard drive(s) boot. There, the SSD has the same name as during POST. But all this as confusing as it is, I was able to install Windows on the drive without issue and everything works. However, when I try to set the IDE setting in BIOS to AHCI, suddenly the drive does not work anymore. 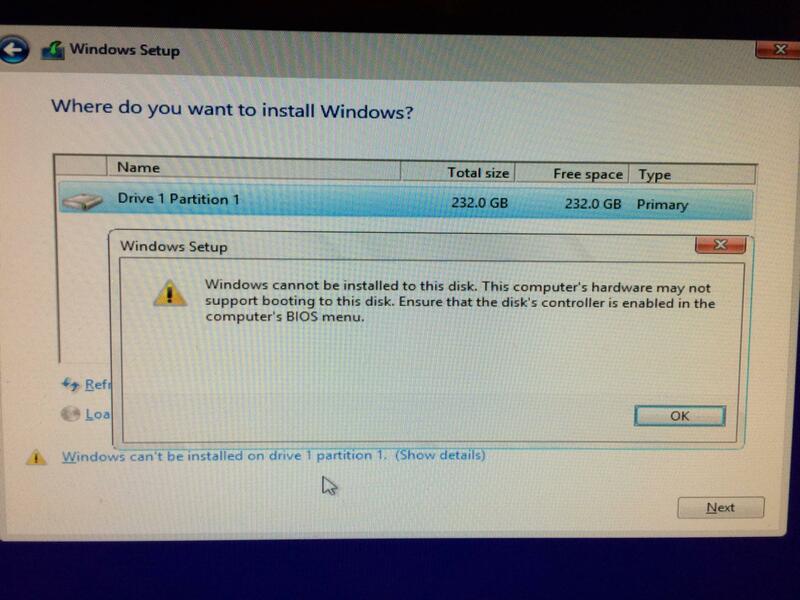 I cannot get Windows to install onto it, this is the error I get: http://i.imgur.com/WPzuLhU.jpg (nevermind the size, it's not my picture). And during bootup only the DVDRW is apparently recognized since before telling me that there's no drive the system tires to "boot from AHCI CDROM". I've even tried swapping SATA cables for brand new ones, without success. The motherboard is updated to the latest (old) BIOS. So does anyone know what could be the problem? Why can't I get this drive to with in AHCI mode? Crucial has my Shuttle motherboard listed on their site, saying the SSD is compatible. This part is 100% compatible with SP35P2 PRO. I would try installing Ubuntu Linux onto the SSD while the SATA controller is set to AHCI mode in the BIOS. If Ubuntu installs & boots Ok, then you know you have a Windows driver issue. Perhaps you can download the SATA & AHCI driver from Shuttle's website so you can have Windows use it during the install (you may need to extract all the files to a USB drive first). Have you reset the BIOS to defaults (or optimized defaults)? Removed the battery (sometimes also requires setting a jumper) to reset it completely? I was trying to install Windows 7 x64. The AHCI drivers should already be present in the installation package. The BIOS was updated to the latest version yesterday so the defaults (and optimized defaults) were set, no change in situation. To be honest not the biggest fan of reinstalled the OS once again (this would be the third time), this is my fathers PC and he needs it. Right now the computer is running fine on IDE, just obviously not as optimal as it could on AHCI. Do you have the latest BIOS for the shuttle? FYI, updating the BIOS does not necessarily mean the settings were reset. Even so you may want to try removing the CMOS battery (if possible). I understand not wanting to reinstall, but it may be the only way to know for sure if there is a driver issue or just a hardware compatibility issue. If you have room on the drive, you could have Windows shrink the partition enough to try installing Ubuntu on to the extra space. You shouldn't need much room for a test (likely less than 10GB especially if a swap partition is not used). Now Ubuntu will overwrite the MBR boot area of the drive with its own bootloader, but you should be able to use your Windows or Windows installer to recreate it (bootrec /fixmbr, or use Automatic Startup Repair). Ubuntu doesn't have to overwrite the MBR, but it is easier than trying to use the Windows boot options to launch Ubuntu. It is odd that the BIOS sees the BX500 in one menu, but not the other one. BIOS implementations are not known for being reliable. Perhaps when AHCI mode is enabled, the BX500 is relaying the 4k sector size instead of the older 512 byte sector size and this BIOS is unable to handle it. When in IDE mode, the drive is responding with 512 bytes since that is all it would be able to recognize. It is odd the the main BIOS page doesn't show the drive in AHCI mode, but shows drive details further in, but I would blame this on strange UI bug between a very old Intel Chipset and a much newer drive controller. First thing, load up command prompt with your installer and do a diskpart clean on the drive prior to installing Windows. Also make sure you get the Windows 7 AHCI drivers shuttle provides on their website for your system, then pre-load them using a flashdrive (preload instructions below). If you do these two things I think you might be able to install Windows in AHCI mode. By the way, you can't just switch SATA modes without breaking Windows. For Windows 7 you need to perform a registry edit prior to making the BIOS changes, or just perform a clean install which will install the correct registry files.